Once you have decided on your greenhouse plans you will need to know how to take care of your seedlings properly inside your greenhouse. Whether you are using a window inside your home or you have an outside structural greenhouse there are some beginner greenhouse gardening tips that will make things easier for you while yielding the best results. Historically Memorial Day represents the opening of gardening season. It is typically when the weather has settled from winter and you can anticipate warmer temperatures at night. In order to plant at the end of May you will need to start your seeds early enough that the plants are strong enough to withstand your outside garden. You will plant your seeds 6 to 8 weeks before the average date of last frost for your area. To find this information you can check with the Old Farmer’s Almanac. Today there are many websites that can tell you, including Modern Farmer’s own quick and handy frost chart. Find your areas average date and subtract six to eight weeks and plant your vegetable seeds indoors. You may choose to plant your seeds in a single large container or you can use individual cell trays or small pots. You will need enough small pots or cell trays to hold all your desired plants. You will also need a good quality seedling mix. A good quality organic mix designed for seedlings will be fast draining, and light. It will usually contain sphagnum moss and perlite or vermiculite. These mixes are formulated to encourage strong, healthy growth in new plants. Regardless of how perfect seeds may appear, germination is never guaranteed. Because of this, multiple seeds are always planted, usually two seeds in each cell of a seed starting tray. This provides a better chance at least one in each cell will take root. When the seedlings are at least a couple inches tall, and have reached their “true leaf” stage, which is when each seedling has sprouted a second set of leaves, it’s time for a process called selective thinning. Selective thinning prevents overcrowding, so seedlings don’t have any competition for soil nutrients or room to grow. This process should be done several hours after watering to minimize stress on the remaining sprouts. When thinning, carefully inspect the seedlings in each seed starting tray cell and determine the stronger of the two. Look for fleshy leaves, upright stems, and center positioning in the space. Using a small pair of scissors, clip the smaller, weaker, more spindly looking seedling. This is also the seedling that is less likely to survive. Cut the undesired seedling as close to the soil line as possible, so nutrients go directly to the remaining plant. Another option is to pull the seedling out completely, but this could cause root disturbance to the remaining sprout. Once selective thinning is complete, there should only be one seedling in each cell of the seed starting tray. Not only does this allow for better growth, but it also creates better air circulation for all the neighboring seedlings as well. If both seedlings look strong and healthy you can transfer one seedling out into its own tray or pot. As seedlings outgrow seed starting cell trays, they need to be transferred to individual pots, or larger trays. This process should not be done until the seedling has hit its “true leaf” stage. 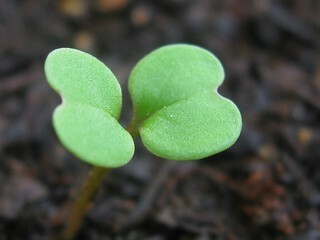 The first set of leaves are the cotyledons, or seed leaves. The second set are the true leaves, which better resemble the leaves of the mature plant. Fill the new, larger pot with good quality seed mix, and poke a hole in the center of the container or larger cell. Place the seedling in the hole and gently firm up the surrounding soil. Always avoid handling the seedling by its tender stems, which bruise easily – always use their seed leaves. About 10 days to two weeks before the time to move the plants outdoors you will need to begin to prepare your plants for survival outdoors. Plants cannot go outside without a period of “hardening off.” This means gradually introducing them to the outdoors to avoid the shock of temperature changes, sun and wind. Start by putting them in a shaded, cool place on your porch or patio that is protected from the wind. Leave them for seven to 10 days, then move them to a shaded area of the garden. Some advise bringing the plants in at night and putting back out the next day. Begin 7 – 10 days before your transplant date. After 7 days, the plants should be able to handle sun all day and stay out at night, if temperatures stay around 50 degrees F. Keep an eye out that the soil doesn’t dry and bake the plants, if the weather is warm. Congratulations you have now started your own seeds, thinned out your seedlings so that you have a nice hardy plant, and planted your crops outdoors. Now all that is left is waiting for the them to mature! You will soon be enjoying fresh fruits and vegetables that you grew yourself. There are many advantages to setting up your own greenhouse. You don’t have to be a skilled carpenter to find a set of diy wooden greenhouse plans, purchase the materials and construct it on your own. Of course you could purchase a pre-made kit that only requires assembly, but the exciting thing about making your own from scratch is that you can determine the size and shape that will best suit your needs. You will also have a sense of pride in knowing that the finished product is your own creation. Here are some tips to help you get started. Setting up your own greenhouse can help you to save money in some cases, and will also allow you to customize it to your own specifications. You will easily be able to grow specialty plants that require temperature and other environmental controls, get an early start on garden items such as vegetables, trees, shrubs, flowers or whatever type of plants you want to grow. You can sow them during the cooler months of early spring and have healthy and robust plants that are ready for the garden spot when the threat of frost is over. The first step is to figure out how much space you have to work with. This will help you to find the greenhouse plans of the right dimensions, for example, height, length, width and so on. Another important factor in choosing the size is establishing what you will use the greenhouse for, what types of plants you will be growing, their specific care requirements, how many months out of the year you will be using it and the volume of plants you’ll be growing at one time. Now that you’ve figured out the size and what it will be used for it’s time to get a sense of what the internal structure should look like. This involves leaving room for walk space and work space, what kind of shelving will be needed, if you will store supplies in the greenhouse, where they will be placed and so on. The type of plants and size they will reach before transfer will help you to determine how much space will be required in between the shelving units. By taking all of these things into consideration, you will be better able to select a set of homemade greenhouse plans that will meet all of your needs. What Type of Greenhouse do you Want to Build? You’ll find that there are a lot of different greenhouse plans out there to choose from. Some of them are free and others are available for purchase. For example, there are small greenhouse plans, medium and large. The most common type are wooden frame plans because the materials are inexpensive and easy to use in the construction. Another consideration is whether you wish to opt for solar power or traditional heating during cooler periods. You may also choose among freestanding units or those which are attached to a garage or house. Before setting on the homemade greenhouse plans that you will use, the type and size, get an idea of what the materials will cost so you won’t be going over a budget, if you have one set. You will be able to find more elaborate plans that can become expensive, particularly if you’re using solar panels, or economy versions. There are greenhouse plans available to suit most tastes, needs and budgets. After establishing the size requirements, intended purpose for your greenhouse, the length of time it will be used and they type that you want to build, it’s time to look at choosing the plans that you will use to get started. The question usually arises about which is better, free or those that you purchase? The answer is that any greenhouse plans that provide a complete accounting of all of the schematics including detailed dimensions for all of the components, materials used, complete measurements and ideally tips on putting the structure together, will do. If you prefer to have customized plans drawn up or are planning to grow specialty items that require more advanced environmental controls, then you may benefit by using the help of professional planners with experience to help provide you with reasonable solutions. The materials and tools required to start building your homemade greenhouse are available at a variety of retailers. You can go to a local hardware store or a retailer that has a home and garden center to price the needed supplies. They can also be found online for delivery to your doorstep. When purchasing materials its best to go with materials that are of good quality. The structure needs to be sturdy and if you stay within the specifications found in your greenhouse plans, it should be stout enough to hold up. Lumber for framing and greenhouse coverings comes in a variety of grades which is what establishes the quality. Yes, you can purchase the less expensive materials, but you may end up saving more by purchasing higher grade products because they will be more durable in the long run. It is always best to stay within the recommended specifications that are provided in the wooden greenhouse plans to avoid any issues with the integrity of the structure and the way your greenhouse functions. Follow the plans to the letter as you put your greenhouse together. Add plants, water and enjoy! Gardeners grow things. This is a fairly obvious statement, but one that bears closer examination. This is so because if gardeners grow things, then it stands to reason that gardeners need to protect the things they grow. Things that grow can be threatened by insects, diseases and animals. However, one of the primary threats to garden plants is weather. Bad weather can limit or destroy a garden quicker than anything else. This is where a greenhouse comes in. A greenhouse can protect plants from all kinds of threats, especially weather. One of the best types of greenhouse is one with a wood frame. With wood frame greenhouse plans, you can build the greenhouse of your dreams and protect your precious plants to boot. Let’s take a look at the how and why. We are children of nature. The great outdoors is where we come from. It is where we developed as a species. The outdoors is where many of us still yearn to be. We are attracted to all things natural. The warmth of the sun, for many people, is a blessing and a boon. The sound and feel of running water is a necessity for others. Still others yearn for the smell of the damp earth of a forest floor, the spicy aroma of a litter of pine needles or the scent of the wind after a rain shower. For them this is an elixir more potent and intoxicating than any expensive liqueur. It is not surprising, then, to realize that the very things we seek in the natural world are the exact things also sought by plants and other green and growing things. It is no wonder that gardening is such a popular pass time. What other hobby can match what you do with what you truly need so precisely? If you are thinking of building a greenhouse for your gardening needs, you probably want to obtain the most efficient greenhouse at the least possible cost. This only makes sense, since wasting money for any space you don’t use is pointless. The great thing about using wood greenhouse plans is that you end up with exactly the greenhouse you need, with no waste. Additionally, by using wood to construct your greenhouse, you obtain the flexibility that wood provides at a very affordable cost. Wood is the most efficient and cost effective of all possible greenhouse construction materials. Wooden greenhouse plans allow you to visualize the greenhouse you need prior to expending money to build that greenhouse. Additionally, if you obtain greenhouse plans that are too big for your needs, or for your budget, you immediately can see miscalculations in your plans and adjust accordingly. This is invaluable when deciding how much money to allocate for your yearly garden budget. There is nothing worse than purchasing a high ticket item, like a wooden greenhouse, only to find that you overestimated your needs for that item. Wood frame greenhouse plans eliminate this confusion and this waste. If you’re looking at wooden green house plans to help you build the greenhouse that best suits your gardening lifestyle then you have to face several hard and cold realities. One of the first of these is the impulse to go big. Every gardener wants a bigger garden. All gardeners are farmers at heart. They all want abundance. They all want surplus. They all want land, and when they’ve got that land they all want more. This isn’t surprising. It’s human nature. We all want the biggest surplus for the least effort. It’s the collision between twenty-first century expectation and nineteenth century technology. How can you expect more, more and more out of a natural process that’s attuned to yesterday, today and tomorrow? Often unreasonable expectations tend to lead to unexceptional results. The answer, when it comes to gardening, is dream big but except more. For many gardeners, wooden lean to greenhouses provide a solution that splits the difference between unreasonable expectations and realistic gardening results. While many wooden frame greenhouses can be expensive, a wooden lean greenhouse is not. This is because of the difference in construction costs and building costs. Many gardeners do not have the space to expand their efforts. This means that they have to work with the territory or land available to them. Every gardener dreams about their perfect garden, but few are able to make this dream come true. This means that the great majority of gardeners make do with less space than they desire. A wooden lean greenhouse means that almost every gardener has access to the advantages that a wooden greenhouse brings. Any gardener with vision can now have the protection and advantage of a greenhouse without the cost. This is what makes wooden lean greenhouses so important. They make all gardeners equal, no matter where they come from. Gardening is a wonderful hobby. It has almost too many benefits to name. First of all, gardening allows you to be outdoors. For most gardeners this is an extremely important benefit. Being able to do what you love in the sunshine and fresh air is a fantastic advantage. Then there is the exercise. It may come as a surprise, but gardening is excellent exercise. In fact, the average adult burns over three hundred calories in only one hour of gardening. That’s pretty impressive. Click here to get your greenhouse plans now. Next, there’s the simple enjoyment of raising beautiful things to look at, smell and eat. All gardeners understand the great satisfaction that comes from growing the vegetables and flowers on your table from hand. Finally, there are the tools and the gadgets that are part and parcel of the gardening game. Every gardener, from novice to expert, has a love for the tools of their trade, so to speak. These tools and gadgets make gardening easier and more fun. Chief among these tools is a cold frame greenhouse. Plants do not like cold weather. Cool weather can slow growth and effect the production of flowers, fruits and vegetables. Cold weather can damage or kill exposed plants. This is where a greenhouse comes in handy. It is also why greenhouses were first developed. A greenhouse is primarily a structure or building used to protect plants, flowers and vegetables from cold or inclement weather. It is also used as a way to extend the growing season for these plants, flowers and vegetables. Let’s say a given geographic location is prone to the risk of late frosts in the spring or early frosts in the summer or fall. A greenhouse is a way to prevent these early or late frosts from damaging plants. Cold frame greenhouses are a simple form of greenhouse that is very easy to make and use. They are nearly always square in shape and built near or on the ground, with a roof constructed of glass or other transparent material. The name “cold frame” means that they are not heated by any artificial means. (As opposed to a “hot frame” greenhouse, that does use artificial heat.) Instead, the transparent roof conducts heat from sunlight into the frame. The frame also acts as a windbreak which, in turn, keeps temperatures raised and steady. Cold frame greenhouses are primarily used by gardeners for two reasons. First, at the very beginning of the growing season, a cold frame is used to gradually expose plant seedlings to outdoor air temperatures. This process, known as “hardening off”, helps the young plants to survive their initial days and nights in the wide world after being started in a house or other warm environment. Second, at the very end of the growing season, a cold frame can be used to allow fall and winter vegetables to continue bearing crops well after the first hard frost. Depending on your needs, cold frame greenhouse plans may be something you want to consider. Whenever you may be working with a larger building project, plans help ensure that the job comes off smoothly. Most of us do not have the building necessary to “eyeball” a large building and make construction decisions on the fly. Plans, drawn by a draftsman and designed by an architect, guarantee that your bigger cold frame greenhouse will remain safe and standing, year after year. In addition, cold frame greenhouse kits are also available. These kits come with everything you need to successfully build a large cold frame greenhouse. This includes framing and roofing materials, nails and fasteners, doors and hardware. Some kits even come with plans to ease the construction process. The only things you need to add are the appropriate tools and the necessary amount of “sweat equity” to bring the job to completion. If you are considering a larger sized cold frame greenhouse, or several smaller greenhouses, a kit is very probably the best way for you to go. For the large majority of gardeners, cold frame mini greenhouses make the most sense. This is so because most gardeners, by necessity, work with smaller scale gardens. If you live in a location with limited space for a garden, then your garden must conform to this limited space. For this reason, a mini cold frame greenhouse makes an excellent do it yourself project. All you need is lumber for a basic wooden frame and an old window frame with the window still intact. First, you frame the lumber into a box the size of the window frame. Then you attach one side of the window frame to one side of the box using hinges. The box is your greenhouse. The window frame becomes the roof of the greenhouse and the hinges allow you to raise and lower the roof as needed gain access and to regulate the temperature inside the box. If you grow plants and flowers, you know what a rewarding hobby it can be. A gardener surrounds themselves with the bounty of nature, as well as its beauty. However, Mother Nature is not always kind to the plants and flowers we work so hard to grow. Cold weather, or even cool nights, can spell trouble for even the hardiest of plants. A greenhouse is the perfect way to protect what you grow when the weather is less than perfect. With DIY greenhouse plans, you can easily build your own greenhouse and make that green thumb of yours a little bit greener. As human beings, we are in love with all things green and growing. We have a special relationship with plants, trees and flowers. The color green, to us, symbolizes life, food and shelter. Perhaps, we feel this connection because we are of the Earth. We recognize the rhythms of life inside each of us and see this rhythm reflected and enhanced in the world around us. We are aware that each of us begins, grows, comes to fruition and fades. We see that cycle repeated in the natural world. Could it be that we love to grow plants because we yearn to control a part of this cycle? It may very well be that our interest, as a species, in gardening is our way of attempting to conquer death and achieve immortality. Very early on, our ancestors realized the importance of growing things. After all, we had developed as a species surrounded by plants of all kinds. We came to depend upon them for food. We also came to depend upon them for different types of materials used in constructing shelter, clothing and even weapons. However, for a long time we were dependent on what plants we could gather. If we couldn’t find enough of the right plants, we went without food, endured insufficient shelter and clothing and inadequate weapons. However, this was all destined to change. Agriculture is the technology that allowed mankind to domesticate wild plants. It can be argued that agriculture was the most important of all human technological revolutions. At the very least, very few people would disagree that agriculture is the technology upon which all subsequent technologies are built upon and depend upon. Agriculture allowed us to break the cycle of abundance and famine that was so much a part of the hunter-gatherer lifestyle. With agriculture, we finally had a surplus of plants. More importantly, agriculture allowed us to have surplus of the plants we wanted, when we wanted them. This is a key fact, because this was the beginning of gardening. It’s important to understand the difference between gardening and farming. While farming is the business of growing food, gardening is the growing of plants for pleasure. It is a civilized art. Therefore, it’s no wonder that it took the development of civilization for gardening to take root, so to speak. Because gardeners grow plants for pleasure, as opposed to growing crops for profit, a need to protect more fragile plants from the vagaries of local climate soon became apparent. While farmers can afford, and actually need, to allow their fields to lie fallow, gardeners had no such restraints. They could grow their plants year round and, in fact, wanted to do so. The greenhouse developed out of this need of gardeners. A greenhouse, as you may know, is a building or structure specifically designed to protect plants from the weather. It is also designed to extend the growing season for plants beyond the limits set by nature and climate for a given locale. Every serious gardener, at one time or another, has either used a greenhouse or wished they had one. Now that build your own greenhouse plans are available online, no gardener needs to go without a greenhouse again. The great thing about a greenhouse is that it is a flexible structure. It can grow or shrink to fit your needs. You can make your greenhouse extremely simple or you can make your greenhouse extremely elaborate. The only limits are your budget and your imagination. A great place to start is with building greenhouse plans. Building plans for a greenhouse are extremely affordable. These low prices mean that everyone, from beginner to expert, can begin to construct the greenhouse of their dreams. Greenhouses tend to be extremely easy to construct. If you have a set of simple tools and rudimentary construction skills you should have no problem putting an average greenhouse together. If your carpentry skills are a little more advanced, you might even want to try drawing up your own greenhouse plans. Either way, many greenhouse plans also come with material and tool lists at no extra cost. In the end, building a greenhouse is an extremely simple project, one that will pay future dividends in baskets of flowers and vegetables. If you want to try something new or different for your garden, you should think about building a small greenhouse. Depending on your finances, what you want to grow and the amount of space you have will determine the type of small greenhouse you can build. Once you do some research, you’ll have a good idea of what to build and you can enjoy it for years. We will check out why you ought to consider making a small greenhouse a component of your garden. If you want to learn how to build a small greenhouse, you need to decide what type of small greenhouse you want to build and how much you want to spend. The less expensive greenhouse versions are made of pvc or wood and polythene and can generally be built fairly easily. Most greenhouse hobbyists opt for the DIY version of pvc or wood so they can save some money. Although perhaps not as visually appealing as the greenhouses built from glass, they serve the same purpose in that they allow the cultivation of plants all year long. If you have a green thumb and want to build a small greenhouse, this is the better and easier option. It might be a good idea to use the less expensive version to test the waters before you commit to a larger expense. The first thing you need to decide is where you’re going to build a small greenhouse. You want to make sure that you place your greenhouse on a level spot with good drainage. You will also want to decide what style greenhouse you want to build. Each style has its own benefits. Once you have the location decided, you can then start building the greenhouse base. Once you have the base for the greenhouse built you can then place it in the location you choose for the greenhouse. Most of the time the different components of the greenhouse are constructed individually and then placed together to form the final structure. After the base, you’ll want to construct the side walls of your greenhouse. The side walls are then affixed to the base and once in place, the roof is constructed and affixed to the side walls. The last structural components to be installed are the end walls and doors. Like the side walls and base, they are built separately and attached to the rest of the structure. When the framework for the greenhouse is in place, you can then attach the polythene cover to finish it up. The type and amount of material to build a small greenhouse is going to depend on the type of greenhouse plan you go with. There are a number of sizes and shapes to choose from and they should include a list of materials that you’ll need to complete your small greenhouse. Before you buy any material, decide where and what size you want your small greenhouse to be. Once you can answer these questions, learning how to build a small greenhouse is easy with the right plan and materials mapped out for you. The initial benefit a greenhouse gives you is that you will have far more options as to what you can grow and when you can grow. There may be some plants, fruits or vegetables that you have not considered growing before which can thrive in the greenhouse environment. Additionally, you will find that you can stretch out the seasons for growing many things and this can be a great help if you are wanting to produce your own fruit and vegetables to eat. Considering that you have complete control of the growing conditions of a greenhouse, you can grow anything without worrying too much about the outside weather conditions. You might be able to save money building a small greenhouse since you can grow your own produce however, there is a cost involved in keeping your greenhouse well-heated in the winter months. If you are a person that sees this as a good hobby there are certainly benefits in being able to put food on your table which will cut your grocery bills while you are enjoying yourself in the process. There are more financial gains that can be made such as giving flowers that you grew as presents or even selling some yourself since the gardening market is huge. If you raise your own fruits, vegetables and herbs, you will soon realize that being able to eat your own fresh food is very satisfying. Vegetables and fruits that you come across in the grocery stores usually lose some nutrients. However, the food you grow yourself is packed with vitamins and minerals. By growing your own fruits and vegetables in a greenhouse, you are ensuring that you are receiving the maximum amount of nutrients your body needs. Working in a garden greenhouse can help people to unwind and take their mind off of the stresses of life. If you hang around happily sowing and managing your greenhouse, you’ll find that you can easily forget everything else going on outside. Because doing work in the greenhouse can be a new experience, everyone in your family, especially your children, will enjoy it and will learn about growing plants. These are merely only a couple of the benefits you can enjoy if you choose to take up greenhouse gardening for yourself. Numerous people enjoy having a garden, but not a lot of people take it to the next level and start looking around for how to build a small greenhouse so they can extend their growing year. A small greenhouse can be an enjoyable hobby, or it could turn into a way of life providing food all year round. Click here to get your greenhouse plans. A greenhouse creates an ecosystem that is maintained properly is ideal for your plants. Plants require warm temperatures so they can grow and a greenhouse is well-suited for this as it traps the heat of the sun. The heat, sun, and moisture levels should be maintained at particular levels for the plants to grow right. To prevent your plants from getting too hot, you have to invest in ventilation and heating systems. An irrigation system is also essential if you wish your greenhouse to be successful. You will need to choose a location to build a small greenhouse that is flat, sunny, has good drainage, and does not have trees around so no branches fall off and damage your greenhouse. For plants to grow to full potential, they will likely need a good amount of sunlight. Healthy growth of the plants requires solar radiation to create the photosynthetic reaction, which the leaves and stems of the plants need. The best location would be the sunniest part of your yard that gets at least 6 to 8 hours of sunlight a day. Ideally you would like to get 8 to 10 hours a day. This location should be free of any falling debris such as branches. But remember the morning sun is the most important. You are going to need good drainage so that you are comfortable. Your plants will need to be watered and you do not want to be standing in a puddle of water when you are caring for your plants. Another reason for good drainage is that you do not want to have water run off from melting snow or rain standing in your greenhouse. You can build a small greenhouse on a slight downhill slope with a layer of rock as your floor if you think that drainage will be a problem. Once you are fully committed to learning how to build a small greenhouse, you need to decide what type of greenhouse you want and how much you want to spend. The less expensive small greenhouses are made of wood and polythene and can generally be constructed fairly easily. Glass, polycarbonates, and, plexiglass are your more expensive options for your backyard greenhouse. Glass is also heavy so you need to go with a better frame structure to support the weight of the glass. Fiberglass reinforced panels and polyethylene film are much cheaper options for your backyard greenhouse. Both can be used as enclosures for wood or pvc. The type and amount of material needed to build a small greenhouse is going to depend on which greenhouse plan you go with. There are a number of sizes and shapes to choose from. Most of the time the different components of the greenhouse are built individually and then put together at the end to form the final structure. As greenhouses generally do not need a foundation you will start with building a base for the walls. Once the greenhouse base is completed, you can then place it in your chosen location for your greenhouse. After the base, you’ll want to construct the side walls. The side walls are then affixed to the base. Your next step is to build the roof. The last structural components of your small greenhouse to be built and installed are the end walls and doors. Like the side walls and base, they are constructed separately and attached to the rest of the structure. Once the framework for the greenhouse is in place, you can then attach the covering of your greenhouse to finish it up. You can get an ebook that shows you a simple way to build a quality greenhouse, regardless of your experience level and your budget. By following these plans, you’ll be able to build a greenhouse without investing in any specialized tools. These greenhouse plans come with exact dimensions, and a list with all of the required materials that you will need. How to grow veggies with a hot bed greenhouse. The importance of a ventilation system and how to choose the correct one. How to get the best materials that will save you money and will last long. Discover ways to use an existing wall and save money on building materials. Discover which size grow rack is best in your backyard. Reading this ebook will give you a complete course in building a greenhouse as well as greenhouse gardening. Every greenhouse question you can think of is answered in this book. To have a successful greenhouse, this ebook and set of plans will be your all-in-one guide. For under forty dollars, you can download the Build A Greenhouse Plans ebook right away. Click here to download your greenhouse plans and ebook. You can have many great reasons to garden like wanting to eat fresh fruits and vegetables to having an attractive landscape. It doesn’t matter what the rationale, it can also be healing, for a lot of people. As long as you don’t view gardening as a nonstop challenge but something comforting instead, then it will relieve your stress. It could actually have a damaging effect if you view gardening as something you feel you are forced to do. When you concentrate on your gardening tasks, you will be able to relieve your stress. Anxiety and stress can be relieved by excavating, chopping and hitting motions. Many people get relief by slamming pillows, hitting dummies or throwing punches in the air so gardening might also be a good outlet. You’re not confined to strenuous activities if you find a need to release pent-up aggression. Your stress and anxiety is also released by simply walking around your garden and enjoying the splendor that you created. Your state of being can be transformed by absorbing the fragrances, the colors and the designs of your garden. You are going to find that your stress has actually been reversed as a result of all the hard work you did in your garden. That which you need to do is make sure your gardening is stress-free. It is best to make a list of things you need to accomplish and follow the list. It doesn’t need to be done all at once, or in a day, otherwise you will just produce stress. Your garden chores should really be done like your exercise program. Work tirelessly, but take plenty of breaks, where you drink plenty of fluids. You can also bond better with your children if you get them to help you with growing. It won’t only teach them a skill that will stay with them, but they will always remember the time you spent with them. Stress and anxiety is responsible for a lot of persistent illnesses for many people so it is important that you learn how to relieve stress. There are garden therapy programs to help people to garden if you lack space to do it yourself. Besides relieving stress, gardening can additionally provide other benefits as well. It is possible to grow fruits and vegetables that you can give away to everyone to enjoy. Getting work done in the sun’s rays while you are gardening can help you with vitamin D intake for your body. This will brighten your mood. It will be possible to ease stress via gardening. It’s also a great way to bond with your family. It is a thing that you are able to do from now until you die. Not just this, but you can easily save money with the fruits and vegetables you grow. If you have never tried organic gardening, you possibly will not know what composting is. It’s organic substance utilized as a fertilizer, but it does considerably more than that when it’s added to the soil. Your plants require minerals and nutrients, and compost gives them that, along with being a mulch and a soil conditioner. Compost is also quite effective in retaining more water in the soil for the plants to grow. You’ll find that there are numerous ways to composting but the easiest way is the no-turn composting method. Ordinarily a pile of compost is turned weekly to quicken the decomposition, but with this method you do not need to do it. To create compost without turning, you just need to add lots of coarse material. Something that works is adding straw, which enables the pile to be aerated by creating air pockets. The time it takes using this technique is about the same as the traditional turn-over method. Using this technique, however, you need to get your compost from the bottom of the pile, and also remember to keep adding organic materials on top, as well as the coarse materials. The foliage that fall during the fall are ideal for creating compost. Take your entire piles of leaves, and transfer them to a shaded spot for creating your compost pile. It must be a spot that also tends to be damp and moist. You’ll need the air to move through your pile so make sure that the pile is loose. The compost will be set for use in your soil within four to six months. There’s not enough nutrients or microorganisms in this compost made out of the leaves to be able to be used as a fertilizer, but it will be good as a conditioner for the soil. Fruits and vegetable scraps make great composting material, as they contain plenty of carbon and nitrogen. Other table leftovers work well too, but pests and animals will be attracted when left over bones are part of the scraps. Helpful waste include coffee grounds, eggshells, seaweed, kelp, grass and shrub cuttings and pine needles. Wood chips, sawdust, corn stalks, tea leaves, wood ash, cardboard, shredded newspapers also make effective material for your compost. It’s usually a smart idea to keep the compost pile covered to keep pests away like fruit flies. As you put in new materials to your garden compost, it is wise to add lime or calcium at the top. You’ll neutralize the stench of the pile any time you do this. Composting is only as tough as you would like to make it. Since compost can be made up of scraps in your home, you can recycle and save money. Composting can make your gardening so much easier. Many people often times don’t know how to build a greenhouse even though they would like very much to own one. Small vegetables can be grown in a greenhouse during the winter months. One more good use is for giving tender plants an early start. The greenhouse provides protection to the seedlings in their early growth stages. Having a greenhouse could be lots of fun also. Having a greenhouse allows you to test with different plants. One of the best investments you could make, would be to construct your own greenhouse. You could have the satisfaction of constructing something yourself. Also, you will be growing plants all year. If you don’t have a lot of money to spend on a greenhouse, you may want to build one yourself and to use a pre-assembled kit. Even with the pre-built kits, you must do the installation, so you are basically paying high prices for the materials. Putting up a greenhouse is a bit more complicated than simply hammering pieces of wood together and attaching plastic. To help you prepare to construct your greenhouse, check out the ebook “Building A Greenhouse Plans“. This ebook was written by a man with a lot of experience in commercial greenhouse management. This ebook is a guide on how to build the best greenhouse easily. This book will provide you all the information you need no matter how small your budget is or how inexperienced you are. The plans simply require you to use basic tools to make a greenhouse. There are plans with proper dimensions, together with all of the needed materials. You will learn some of the following information from this book. Grow veggies in a modular hot bed greenhouse. How to pick out an optimal lighting system for your particular plant species. The importance of installing a ventilation system and how to select the right one. How to choose materials that are long-lasting without burning a hole in your pocket. Find out ways to make use of an existing wall and save money on greenhouse materials. Even discover how to build a grow rack for any backyard size. Everything you need to know about greenhouses, you will learn from this ebook. You can find the answers to every question. From selecting plants, preparing soil mix, pest management, ventilation system, harvesting, and a lot more. In order to have a successful greenhouse, this ebook will be your complete guide. The Building A Greenhouse Plans ebook is available for instant download and has a price tag of under thirty dollars. There are also four extra books containing more information. One has information on a method of heating the doesn’t call for gas, oil, or electricity. In another bonus book, you can find out about cultivating grapes and making your own wine. Another book contains the ins and outs of watering your greenhouse. For anyone who would like to have his own greenhouse, this is a good buy. One of the first benefits of greenhouse gardening for quite a few people is the weather. If you reside where the local weather is unpredictable or varies a lot, you might want to invest in a greenhouse. By having a greenhouse, the environment is more regulated thus making it easier to grow your plants in a routine fashion. With a greenhouse, you will be able to grow larger and healthier plants quicker. It can be considerably more challenging to cultivate your garden without a controlled environment of a greenhouse. A gardener has the likelihood to forfeit their entire crop because of sudden bad weather. Therefore a benefit of greenhouse gardening is that it is possible for the gardener to grow plants no matter what season it is. The way the greenhouse is constructed, allows plants to grow efficiently. The exact degree of heat can be furnished by the heating and humidifying systems that are installed for use during the winter season, especially when the sunlight is limited. For the plants’ proper advancement, it is necessary to have sufficient sunlight. Using photosynthesis, plants have the ability to get the energy from the sun’s rays to help them grow. If some plants need less sunlight, then a part of the greenhouse can accommodate that. An ideal venting system is required to circulate the air so that humidity can be kept steady. Proper accessories usually are needed to keep the greenhouse well-balanced and functional. A thermal calibrating system is one illustration of a basic accessory that is needed to keep the plants growing healthy and large. This should ensure that the greenhouse temperature will be perfect for plants to grow well. A greenhouse that is adjacent to a house is able to use some of the systems that the house has already. Systems like the electricity, water, covering and shading could all come from the house. There are many people who would rather have the greenhouse away from the house to help keep it separate. A greenhouse could accumulate rainwater from the gutters into a water collector. While attending to the plants it is also nice to have modern potting benches and tools, which can be nice for staying organized. Another benefit of greenhouse gardening is having the option of growing your plants hydroponically where organic chemicals are employed to feed plants. This could save time when it comes to cultivating and potting the plants, by using a liquid solution that is directly provided to the roots of the plants. It doesn’t matter which option you choose, greenhouse gardening is fun. If you have been looking for backyard greenhouse plans, there are some things you need to decide on first before you settle on a particular plan. Depending on what you intend to grow in your greenhouse and how much you want to spend, you’ll want to choose a greenhouse plan that fits in your yard and in your budget. Get your Backyard Greenhouse Kit here. The first consideration would be the size of your greenhouse. You want to make sure that your yard can accommodate the size that you’re considering. You want a greenhouse that’s esthetically pleasing to the eye and doesn’t look like a monstrosity. Even though it might fit, will it look good? You don’t want a greenhouse that is going to overwhelm your yard and become an eyesore. Another consideration would be to figure out what type of plants you want to grow in your greenhouse. The size of the greenhouse will also be a consideration in the type of plant you want to cultivate. Larger plants would obviously need a larger greenhouse, so you need to make sure that the type of plant you want will thrive in the size of greenhouse that you intend to build. You also need to consider the placement of the greenhouse. It needs to be put in an area that receives sunlight. If you have a lot of shade on your property because of a lot of trees or because of shade from various buildings, you might have more of challenge in finding an appropriate location. Again, the size of your greenhouse will determine where you will be able to put it on your property. The last thing that you need to think about when choosing backyard greenhouse plans is affordability. How much will the particular greenhouse plan you’re looking at cost to build? The last thing you need is to get into the middle of construction and find that in order to complete it that you’re going to go way over budget. This can be avoided by determining the cost of the material ahead of time and making your decision based on what you can afford. Which materials you’re going to use are going to determine your overall cost. The affordable but least permanent way is to construct your greenhouse out of polycarbonate. This is the milky semi-clear plastic that you might have seen on some greenhouses. The most expensive way is to construct your greenhouse out of glass windows and a steel frame. Backyard greenhouse plans allow you to design and build your greenhouse yourself so that you can have a relaxing and rewarding activity. Not only will you be able to exercise your green thumb, but you’ll also have a place to grow beautiful plants all year long. Considering building your own greenhouse but can’t decide whether or not it is of great benefit? There are lots of benefits when you build your own greenhouse. You control the environment within the greenhouse in order to grow whatever you want for as long as you want. The first and possibly the most obvious are the health benefits. Pesticide and fungicide use is cut down drastically if not entirely as the chance of bugs and diseases are usually not as widespread in a greenhouse. Natural vegetables are significantly better for your health. When you buy your vegetables from the grocery store you don’t know how they had been grown or what was used on them before you get them. Despite how beautiful they look within the supermarket they could have been exposed to a lot of potentially dangerous substances. A lot of chemicals are utilized commercially including chemical fertilizers, pesticides, and fungicides. When you build your own greenhouse the growing season is lengthened to all year if the greenhouse is heated through the cooler weather. Grow vegetables all year round to save lots of cash. Grow plants, clippings, and flowers for special events including mother’s day, valentines, get well, baby born, and so much more all saving money. Gardening in your greenhouse has great benefits for quality time with your friends and family also. Spending time along with your spouse, kids, and friends in such a peaceful atmosphere makes for a terrific bonding effect. Enjoy your time together even in the wintry weather within a warm environment that you enjoy. The one benefit that I like the best is having the nice quiet tranquil environment in the middle of the winter. Getting out in the winter and enjoying what typically is only loved in the summer is great. The sun shining in on you as you do what you like is peaceful serenity. When you decide to build a greenhouse consider the size of your yard and how many plants you want to grow. Are you a hobby gardener that has a few plants or a devoted gardener that wants to extend the growing season by several months? By answering this question you can decide is you are looking to build a small greenhouse and what kind of greenhouse depending on size will work better for you. Pvc Hoop Greenhouse – Can be build as small or large as you want. Lean To Greenhouse – Can be built as long as the wall you are attaching it to. You can build your own Victorian greenhouse which is an energy resourceful greenhouse for year round gardeners. If you choose to heat and cool your backyard greenhouse then a Victorian greenhouse is probably the best option because the gable roof makes it possible for for heat and cooling efficiency. The Victorian greenhouse can fit into big and small yards so long as there will be adequate sunlight. A less expensive choice to extend the growing season is to build a pvc hoop greenhouse. The hoop greenhouse is simple to maintain and is usually a bigger greenhouse. The hoop greenhouse can be used year round being heated and cooled if enclosed with panels as an alternative to polyethylene film. For the smaller yard and less expenditure lean to greenhouses are easily built. The medium size lean to is built as an addition onto the side of an existing structure. Build onto the wall of your house, garage, or a shed. The mini greenhouse or grow rack greenhouse is a great choice for a small gar dener with a tiny yard. Situate the mini greenhouse on your patio, deck, or inside next to a well lit window. Eack style greenhouse has its own benefits. Build your own backyard greenhouse and save a ton of money. There are no special skills required. Basic knowledge is all that is required to build your own greenhouse. After you have selected a location, style, and size of your backyard greenhouse you should choose a cost effective structure along with location. Discover the critical conditions you must have to grow your own herbs including temperature, lighting, and soil. Learn the 8 things you must do to keep your greenhouse from becoming infested with mold, fungus, bugs, and pests.